Chocolate house unique attractions. This chocolate house is located in the village of Jasri Karangasem. The charm of this tour is not in the form of food or chocolate trees, but this one tour is a brown building that appears with a unique design. 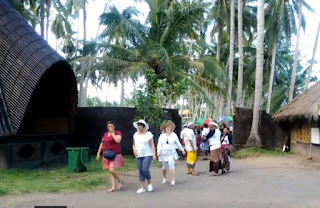 The location of this tourist attraction, from Candidasa beach to the east again to find a fork in which there is a statue of a woman carrying salak fruit. on this statue turn right and follow the path. If you find a T-junction again, take a straight road and follow the road then you will arrive at the Jasri beach parking area. if you are confused or don't know the route provided you can use public vehicles to get to the location of Jasri Beach. This Karangasem Chocolate House is located on the edge of Jasri Beach, under several shady trees, so the atmosphere is very pleasant, calm and fresh. Not surprisingly, besides local residents, there are also many foreign tourists who feel at home for a long time at the Bali Chocolate Factory. there are at least 3 swings tied to two coconut trees, so that visitors can swing while relaxing. There is also a building of wood, which is in the form of a real-looking ocean liner, there you can relax on the boat while watching the beautiful scenery of the coast and sea corals, and tourists can enter the ship room while taking pictures. These tourist attractions can be an alternative for your vacation, so your vacation in Bali is not boring.